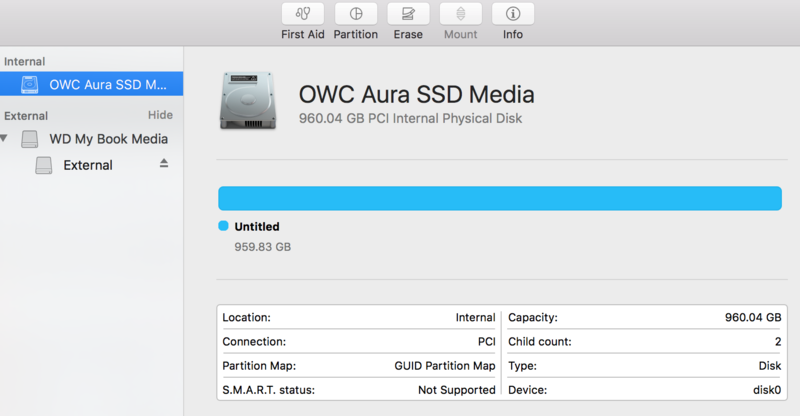 I recently installed Mojave on my Macbook Pro with the Aura OWC 1TB SSD; after installing the firmware update. It worked fine for a day and stopped booting afterwards. I would very much appreciate some help to get my disk back to the Startup Disk without having to re-install or loose my data. Can't afford to Erase this disk. Tried a few steps I got from one of the gurus here @Klanomath. But not sure how to reset the volume information to get the disk back to a bootable startup disk. From the image below, you can see the volume is missing. I am am currently running MacOS X El Capitan from my External Drive. When I run the command to view the disk volume information, it shows that there is no File system. So I ran "diskutil list" and "sudo gpt -r show /dev/disk0" with the following results. Not sure what to do next to get my volumes back and data fully secured. I can see the volume "disk0s2" has an abnormal Type and No name specified. Thus the issue I noticed about the non-existant File system. Browse other questions tagged macos el-capitan disk-utility partition mojave .